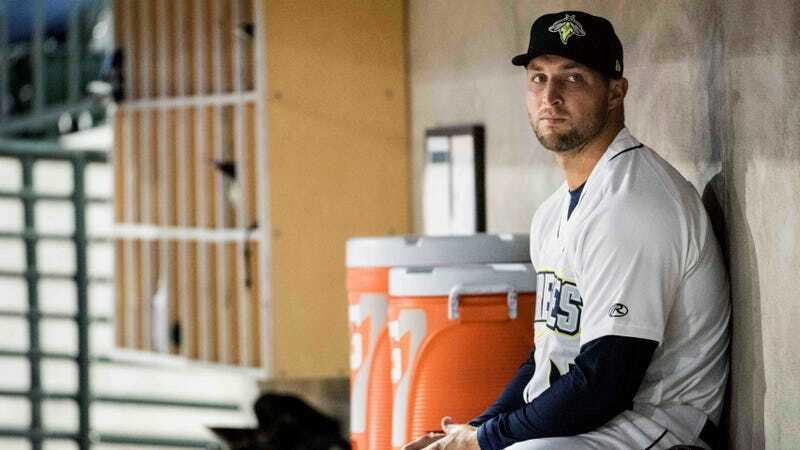 Tim Tebow, who used to be a bad NFL player and is now a bad minor-league baseball player with the Columbia Fireflies, took some ribbing from the Charleston RiverDogs this past weekend. Now the RiverDogs are very sorry about it. The two Single A teams played a three-game series in Charleston over the weekend, and the home team welcomed Tebow by playing a video of him crying during the 2009 SEC Championship game on the jumbotron, putting John 3:16 eyeblack on their mascot, and identifying each visiting batter as “not Tim Tebow” on the jumbotron. “While we believe that our promotions were poking fun at Mr. Tebow’s celebrity status rather than his religion or baseball career, our intent was not to offend anyone, and for the fact that we did offend, we are sorry,” Echols wrote in the statement. If there’s anyone on this planet who never needs to be apologized to, it’s Tim Tebow.